blue whale | Best Road Trip Ever! Built by Hugh Davis in the 70s as a surprise (?!) anniversary gift for his wife Zelda, who collected whale figurines. It is one of the best known landmarks on Route 66. 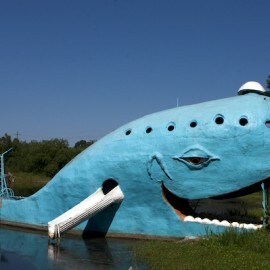 The big whale speaks to a simpler time, when a swimming hole didn’t need all kinds of fancy wave machines and gadgetry.